Let’s face it: Learning how to make money online is difficult. In this post I am going to show you the easiest ways to start making money online today without spending a penny. Because once you figure it out, you’ll be free to live the life you deserve. And honestly: We all deserve that. This article is really long. There are going to be some methods of making money you don’t care about (I’d be the worst virtual assistant ever in the history of the world, for example). Simply click one of the links above and as if by magic, you’ll be transported to the section of your choice. I haven’t tried all of the methods on this list. I’m a writer and I only do stuff that involves writing. There are no scams or pyramid schemes or Nigerian Princes looking for money here. However, I can’t account for the intentions of all the sites owners. You can set up a WordPress blog and mailing list in very little time at all. And for completely free if you keep it WordPress hosted and use a beginner MailChimp membership. For example, Jeff Goins learned a new skill, set up a new blog and made his first sale with 48 hours (without using any of his current influence). It might only have been $9.99, but if you can do that in two days, imagine what you could earn in two months? Selling your own stuff takes absolutely no time at all when you have sites like eBay, Craigslist and GumTree at your disposal. You can have an account created and your product online in a matter of minutes. In fact Ramit Sethi outlines how to go from zero to sale in less than 37 minutes in this guide right here. This isn’t a lucrative way to make money online, but it is almost instant. If you sign up to a site like Swagbucks, you can start earning points and dollars for completing surveys and watching videos in less than five minutes. Spend a couple of hours here and you could be looking at being $10-$15 richer for doing not much hard work at all. Take a look at my personal list of the best survey sites here. Like the above, you’re not going to make millions doing this. But you can start earning in a matter of minutes by using sites like KGB, where you can get $0.25 just for answering questions about a chosen topic. You can easily rack up a decent amount of money by answering 15-20 questions in a day. For example, many Freelance SEOs will charge $150-$200 USD an hour. And some freelance copywriters are making up to six figures a year. Heck, even Seth Godin is a freelancer. Most of these are skill-based jobs. But they’re a great way to make money online from home. I’ve also put the more specific ones in with their respective jobs. This is a one size fits all site for every Freelancer to replace the two separate sites, Elance and oDesk. You can find work here in any field, and you can still use this article I wrote about making money on elance to build a $1,000+ a month business in just a matter of weeks. Another of the ‘if you can do it you can charge for it’ websites. Prices here all start at $5 an hour but can go way beyond that if you do it right. There’s a tutorial right here on how to make the most from Fiverr. Fiverr used to be one of many $5 job sites, but they all appear to have dropped off the face of the internet. So, stick to Fiverr if this is your preferred style. Guru is a lesser-known site but still good for you beginner Freelancers. 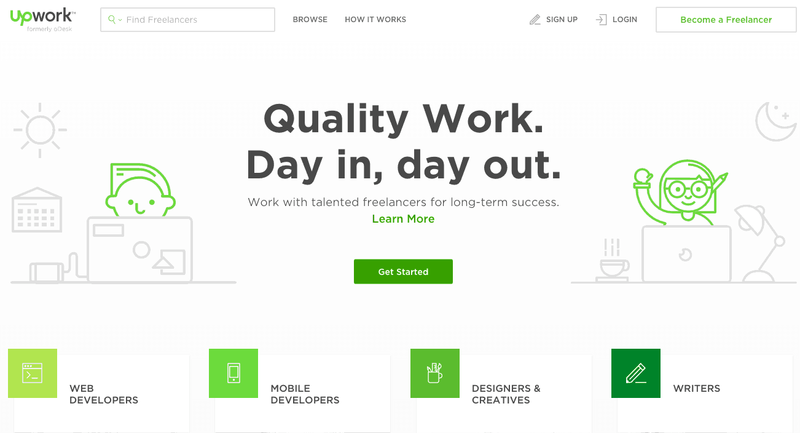 It’s got a little less competition than UpWork does, especially now they’ve merged two sites together. So, it can be good to get a little experience under your belt. While reports and strategies for making money with Guru are few and far between this in-depth look from Freedom With Writing shows how they used Guru to get their freelance business off the ground, and keep it afloat. When AskEustache put Freelancer to the test, he found that he made $250 through their affiliate program, and was able to charge $30 per hour straight away. So, not only can earn a little more than your average first-time freelancer here, you can also make a few bucks on the side recommending people to join too. One of the newer sites I’ve come across, and it’s easy to use and find clients with. But it seems that they’re geared more towards the clients – the person you’ll be working for – than to you as a freelancer. This is a different kind of freelancing, where you get paid for micro- or mini-jobs. For example, commenting in a forum or signing up for a mailing list, that takes no more than 10 minutes. Payments vary on the client and the job, but you can quickly build up a lot of quick tasks that can make you a decent amount of money. While there is still money to be made there, it’s more of a couple of bucks on the side job, as opposed to an income replacing system. Okay, that’s it for the non-specific freelancing sites. Now, let’s look at the different types of jobs you can do, and where else you can make money from them. If a business, company or industry has it, and you write for it, that’s copywriting. If you think of yourself as a skilled writer this is a great way to make money. Especially because clients for copywriting are often corporate and pay in big bucks. In fact, my own personal income started out at $10 an hour in August 2014, and became $60-$80 per hour in less than 12 months. You can read about that growth from myself, right here. The age old profession, right? Journalism now extends beyond the newspapers and their sites and into much bigger online-only publications, too. Admittedly, the pay here can be less frequent. But if you’ve got an itch to write, and you want to scratch it, this is a great place to start. There aren’t any specific places I’d go to look for these jobs. I’d recommend just finding the publication you want to write for, and pitching them. This really depends on the publication you’re writing for, how often, and the subject you’re writing about. There are publications that offer $20 per article, others $250, and some will even still pay you $1 per word. Linda Formichelli of The Renegade Writer started off making $0.10 per word writing for publications but has been paid as much as $2.50 per word to write for national publications. That’s $2,500 for a 1,000 word article. So, there is a lot of money to be made if you go looking for it. So it depends on how prolific you are. You can read from Matt about how to make a successful blog here, and more about owning your own blog later in this article. The second is what I do for a living. And I easily built a $3,500 a month business from it in less than a year. You can use the methods and sites you’ve read so far but you can also find work on the ProBlogger Job Board. Blogging is pretty lucrative because businesses, and people, are now seeing that they need a blog to content market effectively. But there are always people who want to pay less for it too, which is part of getting started. I wrote an article for StartUpBros here about how to start a Freelance Business and build up an income from it, if you want to take this approach. Want to know how to make money online? Get into Ghostwriting. Or anything an author can put their name on. Again, this tends to be easily done through approaching the client directly, or looking for posts on job boards like the ones listed earlier. But the success stories are everywhere for this kind of work. You can find a really good tutorial on how to become a professional Ghostwriter from Write Non-Fiction Now, right here. There are probably a hundred variations of all of those, too. But this is a service that people always need, and if I’m honest, a good reliable designer is often hard to come by. So, maybe it could be you? There are even success stories, like Jacob Crass, who started out doing graphic design on the side through University and ended up becoming an award-winning, high-earning, designer. All from starting doing low level jobs. The ins and outs of programming are beyond my mental capacity. The are so many TLAs – Three Letter Abbreviations – that my head might fall off if I hear another one. But, if you’re here, you understand it or have an interest it in, so I take my hat off to you. One of my favourite stories about success as a developer comes from Spencer Foreman who went from successful freelancer, to flat broke, to six-figure freelancer in the space of a couple of days. And independent developers have had thousands of dollars of success, like Baptiste Greve, who created the game Rolly Candy for just $20 that generated 500 downloads in its first two weeks alone. So, now is a good a time as any to get into the freelance app building market. Who knows, you might play a part in the world’s next Flappy Bird or Clash of Clans? You can find all of these jobs in the same sections as above. According to this thread on Quora, an iOS developer will make a minimum of $25 per hour, whereas an Android developer will start at about $20, and the prices just seem to keep rising into the $200-$300 per hour range depending on the size, or the audience, of the app. This is a real money maker industry, and if you’ve been to Matt’s site before, you know it. People need it, but they rarely understand it. Basically anything you would do at an agency can be broken into individual services and sold at a price. For SEO, the sky is really the limit. For example, Mike Ramsay of Nifty Marketing started out as a $20-$30 an hour freelancer, and now runs an agency worth over one million dollars. But there are plenty of other ways you can charge for SEO services, too, as outlined in this post by SERPs. Where there is a need for writers, designers, videographers and SEOs, there is as much need for editors. To check mistakes, keep creative people in check, and make sure the Internet isn’t plagued with bad writing and terrible designs. For example this stay-at-home mum, Rachel, managed to supplement her family’s income with jobs ranging from $100-$200 each for editing blog posts, and even had the occasional $5,000+ editing job on larger pieces of copy like eBooks and White papers. You can find all these jobs on the industry-specific job boards for your chosen type of editing. And if you want to make some money from helping people, you can definitely make a decent amount of money doing this. But there are lots of extras you could be doing to that are more specific to your client as well. And you’re often an essential part of the team. Virtual Assistants are often people willing to work for low wages from central Europe and the far east. But, there is also a growing contingent of Western virtual assistants, too. Well you can sell your voice as a freelancer and make a pretty penny doing it. This is a really flexible industry, and comes down to far too many variables for me to give you an exact number. For example, my friend Mike Jansen makes a full time living from voice over work – he’s the voice of many independent and short films, as well as the Indianapolis Colts’ stadium announcer – while there are others out there who only make enough for it to be a side project. Meaning it depends on how you want to approach the work, and how much money you’re looking to earn. Freelance teaching is a growing industry online, and offline. Because people need tutors, and location can often prevent you from finding a good one. So, becoming one online (and accessible from the world over) is a great idea to make money. And just about anything you can find a video about on YouTube. Or, any skill you have that people could learn from you about. Remember, you don’t need to be an expert, you just need to know more than your students. The places to find these jobs will be specific to each industry, so you’ll have to do some of your own research here. But you can start by offering services on sites like Fiverr, or by looking on Tutor. And life coaches will charge anywhere between $25 and $500 a month per client. Unbeknown to a lot of English speakers, not everybody in the world understands English. In fact, it’s safe to say most people don’t understand it. So, there is a whole market out there for translating content from one language to another. If you’re bilingual, this could open up a whole new market for you. You can find a lot of translator work here at Translator Base, or you can apply with firms like Debonair Languages. This can actually be a really lucrative business if you do it right. Because, translation is a really in demand service. There are some Freelancers, like Nataly Kelly, who charge the same rate per hour as a lawyer in their local area, which is in the $200 to $300 range in some places. Because you’re not only changing words for words, but you’re also branding, copywriting and editing all as one package. Where there are people making money, there are people who need accountants. And not everyone (myself included) can afford to work with a big firm or agency. So, you can provide your services to a company or client at a discount. Of course, you’ll need to be a chartered accountant to do this and not just own an abacus/calculator/dummies guide to accountancy. I really can’t find enough information to give a true rate on this. But, according to my friends in accounting circles in England their firms bill out between £150 and £300 per hour for a middle of the road accountant. If you’re targeting smaller businesses, you could look around the bottom end of that scale (if not lower), or even creep higher for bigger businesses or work with firms. Almost all of the jobs listed so far also leave you the option to be a consultant for them, too. Copywriting consultant: How to improve in-house copywriting for a business. A little like accountancy, this is hard to define. A Freelance Copywriting consultant, like Art Copywriter, will start at around £240 per day. But, Management consultancy can go up into the $1,000 to $2,000 range in no time at all. If you’re just getting started, an hourly rate of $30-$40 is a good place to start. Set Clear Terms And Conditions: Before you agree to anything, have clear defined terms and conditions about your rates, how you work, when it will be delivered and what the end product will be like. Join A Union: There are people out there looking to take advantage of you, so being part of a union can help. They can advise you how to get compensated, or deal with clients who have taken your work and run with it. You’ll learn how to adopt these for yourself as your business grows and expands, and information that is more specific to your niche. However, be vigilant and always look for ways to make sure your best interests are protected. Blogging has already appeared on this list, but it’s also worthy of its own entire section. Because having a blog is basically the same as running your own business, or owning a shop on the high street, with a lot less of the drawbacks. Bloggers can make anywhere from $10 to $100,000 a month. And depending on how much effort you put into it, you can take over your own current income (if you have one) in a short time. eBooks are books that only exist online, and they’re a great way to make money from your audience. By running a blog, you become an authority in your niche. And that gives you the perfect opportunity to put together a course – video, or otherwise – for people to follow and learn from. Now imagine attaching that power of online courses like that to a blog with 2,000 or 3,000 email subscribers. For example, Stuart Walker’s Nichehacks Mastermind has over 10,000 people and keeps growing every day. That’s a lot of people to sell to. Creating a Podcast, kind of like creating a standard blog post, won’t make you much money. But when you throw advertising into the mix your profits can start to skyrocket, provided you have an audience that listens. Dave Jackson of School Of Podcasting has managed to consistently make money from Podcasts, and even managed to make $1,700 from one single health and nutrition podcast through affiliate marketing, advertising and donations. Starting a Podcast is a little beyond the scope of this article, so if you’re interested, I’ll have you over to this article from Pat Flynn that explains the process more in-depth. You run a blog about fishing. You have a decent sized audience and people like your style. So, Fishing Lines Inc. come along and ask if you can write an article about their product, and they’ll give you cash for it. You create an article that will work for your audience, and provide links out to their site, as well as exposing their product to your audience. They make money, you make money, and it’s all good. Zac Johnson of Blogging Tips took a look into Native Advertising. While this may not be true native advertising, it’s as near as makes no difference to you as a blog owner. Yep, that’s $212.48 in a day from having their adverts on one site. Not bad, huh? There appear to be few credible sites selling sponsored posts anymore. But, if you run a blog, there is no doubt they’ll come to you. Or you can take the Ayboll route mentioned above and see how much you can generate from having them on your blog. White hat. Black hat. Whatever. People are always going to be paying for links because as long as Google doesn’t have the power to go through your piles of receipts, and you do the link in context, there is no way they’re going to penalise you for it. If it benefits you and your audience, you might as well cash in when and where you can. It might be risky at times, but the horror stories from bloggers are few and far between. Now, I’d love to provide you with a case study here of people buying and selling links to make money; but most bloggers like to keep the fact that they sell links under their hat. Clients tend to come to you for this, much like paid posts. But you can also buy and sell links on sites like Backlinks. Okay, if you’re still here, it’s pretty clear that you want to make money from a blog. So, the last six methods you read about are the main ways you can turn a profit from it. But, there are 26 more that you can do to. For the sake of brevity, you can read about all of them in this article I wrote for Matt right here. Which means that based on that figure 34,390,000 bloggers will make more than $100 a month. If you put the effort in the odds really are in your favour and if you’re reading this blog you know it works! There are a few different ways you can make money from YouTube, both in-front and away from the camera. For example, Swagbucks will pay you to watch specific videos or take certain actions on YouTube (among other things covered later in this article). You can earn up to $40 a month from just watching YouTube videos. The real money in YouTube – those big earners I just spoke about – is in endorsements, advertising and promotions. But, it’s still possible to make $100-$200 a month from YouTube by just making videos and putting them online. You’re going to need a lot of views to get that through advertising and CPC. However, the best way for you to make more money in the short term is through affiliate marketing, like John Chow recommends here. In fact, right at their conception, Zac Johnson managed to generate over $1400 from running two sponsored tweet campaigns. And celebrities have been known to make $10,000 for them. Which means if you have a following, or can build one, you could make a nice little side earner from this. But the beauty is you can cash in on it too. You just need to build yourself a following in a specific niche and leave your contact details in your bio. Pick a niche or topic, run with it, gain followers and look for opportunities. I have a friend (who prefers to remain anonymous) in the Male Fashion niche who makes up to $1,500 per advert. So if you you build up enough of a following, you can replace any day job income with it. IZEA isn’t another obscure social media site; instead it’s a way to connect people with large followings – social media, and occasionally blog and YouTube ones – with big brands who are looking to promote themselves. According to Money Savvy Momma, the way it works is that you sign up the site, and you ‘bid’ on the ability to share an update based on the criteria of your audience. Basically, if someone is looking for 30-45 year olds who are into sports cars, and your following fits that, you can bid on it. The winner of the bid gets to tweet and gets paid for it. It doesn’t seem that there is a lot of money to be made here, but there have been tweets that have gone for $50+, so if you build enough of a following you’ll be able to earn more money. This is the big kahuna of making a living online, right? This is where you find everyone from the Weekend Hustlers through to the $10,000 a month legends, and everyone in between. I could turn this whole subject into an article on its own; but I won’t. Let me explain what an affiliate is, and show you a big list of places you can start affiliate marketing. Being an affiliate is basically investing time and effort into promoting a product and making a commission every time you complete a sale. This works best when you have a platform – like a blog, or a YouTube channel – to sell from. But, there are lots of other ways to do it too. You can either find affiliate opportunities on certain sites that compile them all (see below), or you can go directly to your favourite products themselves and see if they have a programme. This is an industry full of variables, so instead, I’m going to point you to this income report from January 2016, so you can see what’s possible and what just starting out looks like. These are two money making powerhouses back to back, aren’t they? Advertising has been, and probably always will be, one of the best ways to make money online. While there are camps of people for and against it, advertising plays a role in almost everything online. And if you’ve got the space to put adverts there, you should take advantage of it. These sites work like Google Adsense and choose adverts based on the content of your site, and some of the habits of the user. Meaning you have a little less control over what’s seen, but a better chance of converting. Instead of paying for clicks on an ad, CPM pays for pageviews. Usually a specific amount per 1,000 page views, but that will vary depending on the client. You’ll also need quite a big following for this, so if you’re just starting out, it might be one to think about for later. Got a product you’ve made, designed or created that you want to sell? Or, just want to shift some of the stuff from your attic? Amazon: What, have you been living under a rock? Craigslist: This is proper Craigslist, not the other one with all the weird stuff going on. Swappa: Focuses on tablets and phones. Bonanza: The best eBay alternative on the market. You’ll need an account, and probably a PayPal account to make it all run smoothly. But these are the main ways to sell your general items. Sites like Amazon and eBay have spawned hundreds of profitable businesses on their own, just from people selling their own products. eBooks are usually the realm of bloggers and internet celebrities. But, the truth is, if you have an idea for a book, anyone can create and sell one nowadays. And while it definitely helps if you have a platform to sell from, you by no means need one. If you consider yourself a specialist, or good enough to teach, in a specific subject then you can turn it into a side career or your full time job. There are people making $100,000+ a year delivering online courses, so it’s lucrative if you do it right. Websites are real estate. And no matter what your domain, people want it. In fact they’re dying to buy it from you. And if you’ve got a well-established site, you can sell (or flip as it’s often known) it for thousands of dollars. You’ll need to have built up a site and an established flow of traffic to get the big money here. But you can even cash in with your smaller domain for a small amount, too. Or, if you’re more into the website flipping side of things you can check out Greg Nunan’s story of how he flipped a site for $16,000 at Empire Flippers. If you’re an artistic and creative soul, you can make money creating just about anything online. And by anything, I mean anything. There’s a market for everything. For example, if you’re into art, design or illustration, you could start making money with DeviantArt. Don’t fancy being a freelance app creator? Don’t fret, there’s a whole world of people who will buy the ones you’ve created from you. A little like buying and selling websites and real estate, you can create and flip just about anything here. Carter Thomas, from Blue Cloud Solutions, went from $1,000 to $200,000 flipping apps not too long ago, and he outlines how you can do it right here. If you’re creative, but you prefer to keep your designs to a more web-based format, like WordPress themes, site designs and fonts, there’s still a huge market for you. Think your music career ended in your Aunt’s garage at 16 years old? Think again. You can make a decent living out of the music industry online, you just need to know where to do it. Case Studies are few and far between on this front, but I did find this Tech Crunch interview with the creator of DistroKid, that shows proof of people making money, like the duo Jack and Jack, who, thanks to the site, are now embarking on their 18-city tour of the US. There’s a lot of money to be made in video production. It’s fast becoming the favourite content type for Facebook, and more and more video content is showing up around the Internet. You just need to know where to look to monetize your videos. I know as a blogger myself that this is an industry that people need, and will pay a lot of money for the right image. Michael Jay, a photographer from Berlin, has been able to consistently make $200 a month from Shutterstuck, Fotolia and iStockPhoto. If you’re human, you probably have a room or attic or cupboard full of stuff you’ve not seen or touched in years. If you’re not human, you’re probably not reading this. So, I’m going to assume you do have stuff to sell. People actually make entire family-supporting incomes from buying and selling this stuff, so the money is always there, if not a little inconsistent. But when you can make $30,000 from a Darth Vader toy, you can see why people do it. This isn’t just for geeks and dudes into cosplay, either. You can do this in just about any niche, from antiques, to old books and even snow globes or Dutch windmills. If you want to go the whole way and create your own online store then you should checkout this full guide from the team at Foundr – The Ultimate Guide To Starting And Scaling An Ecommerce Business. The financial and real estate worlds are moving from the high street, and focusing more on the online market. So, now may be the time get involved and start making some money through these channels. After all, they’re two words that are synonymous with dollar signs, right? These are all regulated and you have a lot of protections in place. So, it’s not like just giving your drunk mate $25 that you’ll never see again. But, like I said, this can be quite risky. So, before you take part in any of these schemes, I’d take a look at this guide from Money Saving Expert. This is only a small one, but you can earn an extra $100-$200 for doing something that really won’t affect your life in the long run. You can get more interest, better rates, or actual cash in hand just for switching your account(s) over. I used to have a client I ghostwrote for who, at times, made $1,000-$2,000 per day on the Foreign Exchange (Forex) market. Like all trading – as you’ll see next – it’s a little like gambling, and is risk and reward. I’d suggest reading more from the pros right here. Stock Brokers are world renown for making (and losing) a lot of money. Now, finding a reliable case study about online stock trading is pretty hard, because people like to keep that under their hats a little. People will literally pay you to do anything on the internet (hey, reign your dirty mind in, you!). And you can make money online from home by simply taking surveys, trials and doing basic tasks. You won’t get rich doing this, but an extra $20-$30 dollars here and there is always nice at the end of the month. Payments here vary for each site, but there are people who have made $300 to $950 in a year doing this. But they will pay you to do it, so why the heck not, right? 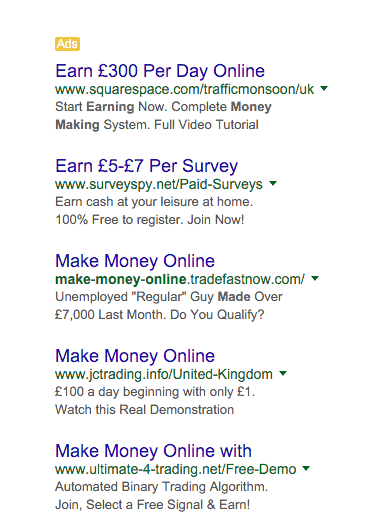 Be sure to check out my more detailed tutorial that shows you how to to maximise your earnings with survey sites. Cashback works by making you an affiliate of an affiliate, if that makes sense? For example, DavidBuysThings is an affiliate of Target. You buy your kids birthday present through DavidBuysThings at Target. You get a percentage of his percentage of the sale. These are a no-brainer for making money online, really. You’re going to buy stuff anyway, so you might as well get paid for doing it. It’s kind of like watching a movie before it’s released to tell the director if it’s good or not. So while it is a worthwhile way to make a little extra money, I wouldn’t suggest you turn it into a career just yet. Product Testing: Testing products before release. Games Testing: Gameplay testing games before release. Music Listening: Listening to music, and quality, and reporting if you like it. Focus Groups: Letting companies test ideas, shows and other items on you. Website Testing: Testing experience, ease of use, navigation etc. This isn’t always paid, but it often is. For example, Pinecone Research will pay around £3.00 per survey or product tested, and you usually get to keep the product afterwards. Despite what other sites might tell you, I’ve only found two legitimate ways of making money from listening to music. The first is Slice The Pie, where you get paid to write reviews. The second is Music Research, where you get paid to answer surveys and questions about music. The pay here isn’t exactly great, you’ll be looking at starting at £0.03 per review on Slice The Pie, but if you’re really in need of an extra couple of bucks, you could probably build this to a decent little saver over time. This is split between online and offline, and could be subject to location, but you can earn from $25 onwards, with your expenses covered, using one of these sites. Renting space you do have, even just a room in your house or apartment, is an easy way to make extra cash without having to do any work (except for maybe a quick vacuum and making a bed). For example, Evan here makes $11,000 a month for renting out his San Francisco apartment. In his words, “I get paid to simply NOT be in my apartment”. Not a bad job, eh? Niche Sites are specific sites that target one area of life or interest. For example, Joe’s Daily is a niche site about Men’s Lifestyle, while Sean Ogle’s Breaking Eighty is a niche site all about golf. You can always argue that owning any website is a niche site in one way or another. But, Niche Sites get a section all of their own because they’re a little different. Why? But the days of super-specific niche sites, where you only build around one keyword are long dead. They just aren’t rich enough for Google, or for people to trust to buy from, anymore. There needs to be depth of content, like in the sites I linked to above. And many, many more I’m sure. Like everything else with money, it depends. Your income can range from $10-$20 per month, all the way up to $6,000 and beyond. And by beyond, I mean six figures and more, if you get it right. Starting a niche site is a little beyond the scope of this article, though. However you can find a killer guide to getting one started right here. The life of a freelancer or an entrepreneur isn’t for everyone. Sometimes you want to make money from the comfort of your own home, without having to worry about how much your paycheck is going to be every month. That’s where work-at-home companies come into their own. You can find work for companies without ever having to take off your slippers. But you can also discuss remote work by talking to employers, too. But that’s a little beyond the scope of this article. And a bunch of other factors I’ll never understand or agree with in the working world. Most of these sites don’t share their average salary for people, either, so I’m afraid you’ll have to find a job and apply for it and request that information. Agony Aunts (and Uncles, don’t worry fellas) aren’t only found in the back of the newspapers. In fact, there are people who will pay you to give advice and answer questions all across the internet. Content Mills – sites that create lots of content for a small fee – have a bad reputation. Not because they aren’t a good source of making money. It’s because writing purists think they’re the equivalent of wiping your bum with their manuscript. There’s no limit to how many you can write in a month for them, either. Okay, this is the part of the list where things get a little disjointed. These are the weird, wonderful and erm…different, ways you can make money online. Not highly recommended, but they’re still there if you want to make a couple of extra dollars here and there. Like AirBnb has taken over the world of rental properties and hotels, the same tend is happening for cycling and bicycles, too. With a huge rise in Copenhagenization – the redesigning of cities to be more bike friendly – it makes sense that this is a rising industry for tourists and locals. From Poker Tables to Bingo and everything in between, you can make a decent living from Gambling Online (or, you know, lose it all in an instant). However remember Gambling is addictive, so please take this section carefully and make sure you only ever gamble with money you do have, and don’t get yourself into a silly situation. It’s been the elephant in the room for this whole post, and it’s still a legitimate way of making money online – albeit not for everyone – so I’m going to briefly, and in the least awkward way, approach it. You can make money from P0rn0 sites online. So, while I’m not going to recommend this as an industry to make money, it’s one of the most sought after things on the Internet, so it’s always an option I guess. Okay, I think you’re aware of just how…odd, the Internet can be. And you can sell, buy, trade and make money from just about anything you can think of. For example, you can make $5 on this site just for selling your soul. Yes, that’s right, your soul. You can even buy one if you’re really in the mood. Now, while I’m not going to go out there and tell you to get stuff tattooed on your body (although I just text my friend telling him he should do it), it’s pretty lucrative. Billy was selling off small tattoos for between $2,000 on his chest and $20,000 on his forehead. But, I should warn you, Billy currently wants the tattoos removed off his face. Because, well, they’re mostly p0rn0 sites that don’t exist anymore. Who knew getting that tattooed on your face could get old, eh? Scammers are everywhere on the Internet. Whether it’s your first time trying to make money online, or it’s your hundredth, you’re still open to the threat of scammers. And if you really need the money you’re trying to make online, it’s easy to be sucked into them in the hopes that everything will turn out alright. You may also find that they ask you to take on work for a percentage of their profits when the business finally goes ‘live.’ If you see this, I’d cease communications altogether. While they may seem genuine, there is a good chance that they aren’t. For most sites you’ll be covered for this, so you won’t have to worry if you’re using a large site like eBay or Amazon. However do be careful if you’re using one of these sites and people ask you to sell outside of the site. For example, they ask to buy your item at a higher (or reduced) rate outside of the site. There is a good chance you’re being targeted for a scam, and I’d recommend walking away. In a world of Herbalife and Juice Plus, pyramid schemes have started to make a comeback under lots of different guises. They often call themselves Multi Level Marketing programmes, or other similar names. And they can leave you out of pocket, with no way of getting the money back, other than to sell their products. But these companies often disappear into thin air overnight, too. Best to avoid them at all costs. These people will advertise a job – possibly remotely – that fits your niche and skills. Then, they’ll say before you can be accepted to the job, you have to complete this training course that costs you x, y or z amount of money. You’re just $200 short and no further forward in your career. Make sure you always do you research and look for reviews, or employer information, before you try any of these. Phew, there you have it, over 465 ways to make money online. Some quick earners, others you have to take for the long haul. But there are no scams, no get-rich-quick schemes and nothing scandalous that could land you in hot water. And be sure to be on the look out for any and all scams that could be flying around on the internet. So now you know how to make money online – where are you going to get started? Oh My! This is insane. What a big list. I don’t think anyone can get any beyond it. I haven’t tried all, obviously, but I do earn my living through affiliate marketing and freelance writing. I will surely try a few of what’s mentioned here to beef up my income though. What are your tops tips/advice for freelance writers or anyone that wants to start? As a freelance writer myself, I would suggest budding writers to create a strong portfolio of their writings. it can be on medium, pulse or a blog (like mine). Writing content for the people in your niche helps a lot. For example, I wanted to write for small business owners so from the very start I wrote about the problems they faced (content marketing and social media visibility). This gave me an upper hand when they searched in Google and after they liked my content, most ask me to write for them. Next is influencer marketing, I am a big fan of it. I just locked a deal to ghostwrite for a Forbes top 25 influencer with this technique. There are more tips that I can give, maybe in a guest post? Would love to hear about those topics. Thanks. Thanks Matthew. What I meant was … “was hoping you’d mention something along the lines of ‘How to create your own small ad agency’, or ‘How to sell marketing services to small and medium size business”, on another article. Clearly one can ‘drill down forever’ but that’s not what I meant. Would love to read about the topics I mentioned should you one day happen to write about it. I don’t think I’ve come across an article offering this much value like FOREVER!! I personally make my money through freelancing, ad revenue, affiliates and sponsorship. In the future eBooks and courses are definitely on the agenda though. No problem Ricky I am glad you enjoyed it! What kind of sponsorship do you do? Mainly working with UK brands such as Tesco, NatWest, Aviva etc.. I love each and every post of your. You are really a great teacher and bring great value and hope to newbies. :) . Do you provide coaching? Wow! What an extensive list. Great job putting it all together. Hi, Mathew!! I am reading this post it took me hours to read.I was impressed how much hard you wrote.That’s why you are the master in blogging field.You having tremendous knowledge.keep rocking and congrats for your work. Thanks for sharing these money making methods. Been doing some of them and never knew so many other ways to do so, it’s overwhelming! Thank you James for the article. It is nice to have a list like that in our bookmarks. I would like to emphasize that the best way to earn real sustainable profits online is by building your brand and selling your own products. All the other methods like offering services or doing affiliate marketing take the second rank. Thanks Matthew, great article. I noticed on the email I received about it that you state “Pro Tip: If you can string a sentence of English together, the quickest and easiest way to get started is as a freelance writer. I pay thousands of dollars per month to freelance writers and it’s a skill that most people have.” but I don’t ever see such expenses on your income reports so why is that? The longest and yet most engaging article. Meaty all the way. Certainly stored away.Go through it again this weekend more critically. I had no idea there were so many opportunities to make money from home, online. When I think about making money online, my mind automatically goes to “blogging” and “websites”, but it seems there’s really something for everyone. It’s so great that there are so many freelancing sites out there- people can take what they’re good at, or their hobby, and make it profitable. Very informative piece that I will certainly be referring back to in the future! There is always more than one way to skin a cat :) And in this case, there are hundreds! Hahaha, I do but it needs a bunch of linkzz! The biggest list I have never seen, thanks a lot mate for sharing. Thanks a bunch! What a fantastic article Matthew. I had to copy paste into word (not to save but just to see stats). It ends up this article would be 90 pages and over 13,000 words. Hi matthew, I just bookmark these big lists. This post will help everyone to make money online not skeptical. Thanks I hope it helps you out! This list is CRAZY long and usefull. Have bookmarked. This is a great article. Very informative! Thanks for featuring one of my article. Great list! This post is really helpful for people who are looking for online money making opportunities. That is a good combination, are you seeing success? Thanks Bris I hope it helps you out! I was known a many new way to take money online. This is QiA< Marketing reseach, and sites rewiews. And a was known a new differents views on article writings and other. Site buildings thats may be onse more way to MMO. No doubt , Very nice article , There are an option to online earning “Dropshipping”. you can include this idea also . Wow. I have followed your blogging from the start Matthew, you have done some epic posts over this time but this one is just immense. It is the most comprehensive list I have seen although the term ‘list’ does not do it justice. I am still checking out some of the resources you added and will probably still be going through them at Christmas . Great job mate. This is an ultimate list. I will take lot of time to read as well as start working one by one for all the items. I dont know how much time it took to develop this article. It is amazing and I think you should publish a book of this article. Yeah there sure are more methods to make money online than you can shake a stick at! Very informative information, would like to do something in the Dominican Republic where we both can ‘win’ there are a lot of people looking for jobs, but I am not as skillfull in the area as you are. Well there is huge opportunity online for anyone, especially if they speak English! Great Read! Took me a while to read it but very thorough and tons of great information. Just have to remember one at a time. Thank you! I love each and every post of your. You are really a great teacher and bring great value and hope to newbies. Thanks :) I hope it helps you to grow! This is the biggest article I have ever seen. Great article with a TON of useful information. I am reading this post it took me hours to read.I was impressed how much hard you wrote. Of course there are people that make money in pyramid schemes, that’s how they work. Just like a ponzi scheme, there are people that make money – that doesn’t mean its not a scam. And man, I could write a huge piece about exactly how Herbal Life scam people – not only in the quality of the product but also the lies that are used to sell it. So I don’t need to knock it, they knocked themselves and looking at your Gravatar image, it doesn’t look like the product worked for you either. It’s much better to just get your hands dirty! please help me for the fiverr because i am beginner pleas guide me i am very thankful to any one who help me…………. god is great ………. Interesting. Making money online is more difficult than it normally sounds. But who hasn’t gone into it won’t know. However, it remains the most assured way to make money while you sleep. Lol! Who wouldn’t want to make money that? On the move! That is great to hear, I was recently hired to crack the Amazon ranking algorithm and I have a huge ecommerce background so I’ve always considered a dabble in Amazon FBA personally! My God, Mathew! Thanks man. The most useful list on the internet yet. I’m actively involved in some of these methods and hope to integrate more over time. Internet is just awesome! I agree, it has changed the world! I was quite interested to make money through onlie. For that I’ve started a WordPress blog. Ofcourse I was not yet started earning, because I’m new to this industry. Hope soon I will start earn a god figures. SEO has been my favorite way. I need to branch out. Thanks for the in depth ideas! I’m glad to see affiliate marketing got a mention. Affiliate marketing is one of the easiest and fastest ways of making money online without the need to invest a lot of money. I hope it helps you to achieve success Dharma! Great write-up! This is exactly the insights on how to make money online. If we follow all the methods listed in the content, we can easily earn money online. That is great advice, there has never been such an opportunity in modern history! Good list of how to make money online. I think paid surveys it a waste of time and money. Now I will have to try something else with these amazing list. You mean that you are looking for someone to do the SEO for you? Holy Cow… That’s a big chunk of ideas and ways to earn a living online. I actually liked it a lot, because most of the time I see people writing about such things, but mentioning just cashback options, surveys, testing apps, which are paying peanuts. I do understand that it’s a way of earning something online, but nowhere near earning a living. Thanks for sharing such a huge list. I’m psyched. Thanks. Hopefully there is something that stood out for you! Very insightful! I love the addition of the links for further individual research. Advertising on your blog and affiliate marketing are two best ways to make money online in my opinion. Building niche blogs and sites and then promote affiliate products. Wow! Such a huge list. I didn’t know there were so many ways one can make money online. Thank you for sharing, Matthew. Fantastic Blog, great information, I get a lot of clients through who are desperately seeking income sources or 2nd income sources, so I have bookmarked your page now and I shall recommend it to my clients and others, great work and research and very helpful and informative, thank you for caring to put this together. Please more of these, cheers! No problem, it’s what i do. Thank you for this insightful article! My recent hobby is participating in online surveys and that really helps my side budget. Google has a book selling programme which is an amazing platform for the book lovers and writers to generate revenue from it. Thanks for sharing this blog. Very nice blog!! Great online money making ideas. I was looking for the simple and fast ways to earn money online. And here I got several ideas that help me lot to earn some bucks. Very Useful article. You did very hard work. Keep it up. I think after following this step anybody earns money on YouTube or online. I love it how the internet has opened up a whole new world of opportunities! Sir your article was really helpful. the way to Earn money you suggested are really good. http://bit.ly/2L1BHOB is the option i am trying. Sir/mam Very nice and educational article. I am your daily reader and follower in every social media. Thank You So much and please keep it up. Keep Providing us educational articles like this. Thank You . I just got motivated from this. Thanks Mukunda, I will do. the information you share is amazing and informative realy.i am learn lot from your article . Tank you for sharing the great information. Great news! Sounds like you’ll be making money online in no time! Very useful money making methods. I love your article very much. Thank you for sharing it. The Article is very useful and information you shared is indeed useful for me. making money is very easy now visit earnhoney.com to learn more about online earning. No problem, I hope you found some helpful ways to earn. Hi sir, Really very useful and valuable information. Who want to make money online. Thanks very much. I hope it has helped people to get earning online. It helped me a lot to know how one can earn from the Internet. There are soooo many ways! REALLY make some money with all these stuff, especially with filling surveys. So many ways you can make money online that nobody has even considered! Thanks for ones marvelous posting! I truly enjoyed reading it, you are a great author.I will always bookmark your blog and will eventually come back later on. I want to encourage yourself to continue your great posts, have a nice evening! Thanks very much Chandana, hope to see you here again soon. Thanks for the great knowledge, I also recommend http://tidyurl.com/hvl2ym They are the best without any failure and everything you need to know in one package. Just subscribed to your black friday deals newsletter and found this post. Blew my mind. I never knew that there were so many freelance websites out there. Hey, thanks very much for subscribing and checking out my blog. Glad you found the post useful. Really really, this article is a really great article. I wish I could write an article like this !! I am a newbie in this. So, I have no experience. But after reading, I got some ideas which I can now implement on my article. Thanks a lot for sharing this, Sir . Hats of you ! Thanks very much, which ways are you gonna try out? Cheers Umesh! Let me know which methods you use. Good tips to earn money online . Cheers, hope they work for you. No problem Jasmine! Glad to help. Thank you Matthew. This is a well detailed article. As for me I only do blogging but now I want to look into sponsor post because I made few dollars from it. Now am going to try survey too. I will try other tips one after the other. When I started my journey about finding realistic ways to work online I tried many methods. It took me a long time to test those different resources, to understand what works, what doesn’t and how much time it does require. Finally I decided to wrote a book about it so people can save time and time is money right? I hope it will help as many people as possible looking to escape the rat race. If you find it useful please remember to leave a (hopefully nice) review and share it with your friends. It would help this young author a lot. Thank you and good luck! Hey William, thanks for the recommendation. Very useful information with practical ways of making money online. I have always wanted to make it and this article just opened my eyes on new online opportunities. Great news, I hope you find the right method for you! This article is very helpful for me thanks for sharing. No worries John, let me know how you get on. Let me know which strategies you decide to try out. Pleased to help! Which strategies are you gonna try? Haha thanks very much Ravi! Some great opportunities to make money online! Best ways to earn money online, thanks for sharing this. No problem Jitendra, any favourites? Sir a big thank you to you. By your efforts it make me what i am. I am able to earn and have an idea how things work. All credit goes to you. I highly appreciate your knowledge and teaching skills. Thank you very much sir. You’re very welcome Harry! Keep hustling! Hope you found the perfect way to make money online Dhurendra! No problem, I certainly will do. Hope you found some great tips in this article. Very useful article for me…. Good! Hope it helps you to generate an income online! i like your point to make money with blogging, thanks for sharing. This is helpful information to earning online. Thanks for sharing your thoughts. Thanks hope it was useful! Very Good article, Thanks for giving us helpful info. On every purchase from your store, you will get commission, it is very easy and free, everyone should try this once. Very nice article, thanks for sharing information. Happy to help! Hope you found the article useful! Very nice article. Thanks for sharing your information. Glad I could help Deepak! Which methods are you gonna try out? Awesome news! Good luck with your new venture. Thanks, hope you found the best way to suit your goal of making money online. I am new in this field and building up my website, working hard on it. Blogs here are very much helpful. And especially this blog on Backlinks which has provided to the point information helped me a lot. Keep sharing these kinds of information. Welcome to the online world Nazrul! I certainly will! Mathew your site and content are simply amazing. This is how we should all model our niche blogs and sites. You give away better content than a lot of others are charging for. I for one plan on reviewing everything I can from you and do something like it in my niche. Thanks James! It’s a pleasure being able to help people succeed with there online ventures. Thanks for dip information, you are real teacher. This information is very useful for those people who want to make money online. Thanks for sharing this information. Thanks for giving this information, these information is very useful. Thanks Mukesh. There’s plenty more to come! Thanks for the nice information, you are great teacher.